Galerie Fischer was founded in 1907 byTheodor Fischer (1878 –1957), a former director of the Bosshard Gallery in Lucerne, one of the leading galleries of fine art and antiquities of its time. Theodor Fischer always attended to the business of running the newly established Galerie Fischer with great enthusiasm. He opened a branch in Berlin, which operated with success until after World War I and the impact of spiralling inflation. Historical events both during and after World War I yielded a number of important collections from Europe’s nobility and their estates, to be auctioned in Switzerland. 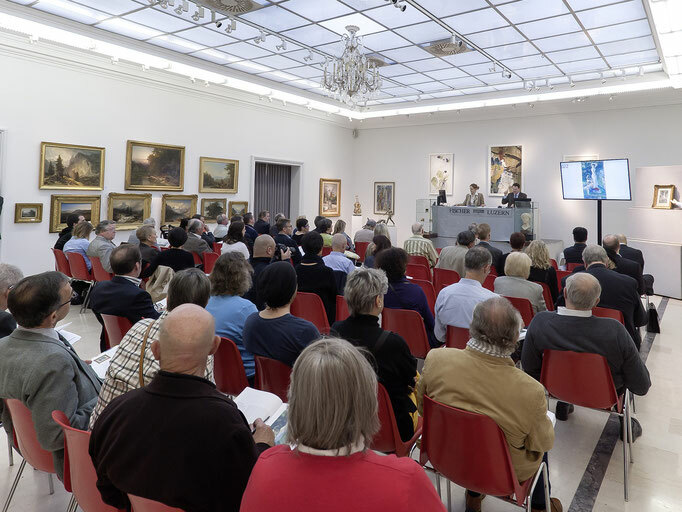 Likewise, an abundance of fine paintings and antiquities was entrusted to Galerie Fischer for sale at auction following both the wave of emigration between the two World Wars and the need for reconstruction capital after World War II. Between 1921 and 1939 Theodor Fischer regularly held his auctions either on the premises of the Grand-Hotel National in Lucerne or at the Zur Meisen Guild House in Zurich. In 1939 he ordered major extension work to be carried out at Galerie Fischer so that auctions of international standing could now be held on dedicated premises on Haldenstrasse in Lucerne, in spacious, stately and stylishly elegant surroundings.Theodor Fischer had by then established himself as a leading auctioneer on the European continent. 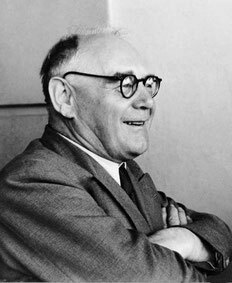 His two sons Arthur (1905 –1981) and Dr Paul Fischer (1911–1976) soon added their own energetic support to the diligence of the company founder, and went on to run the business after their father’s death in 1957. 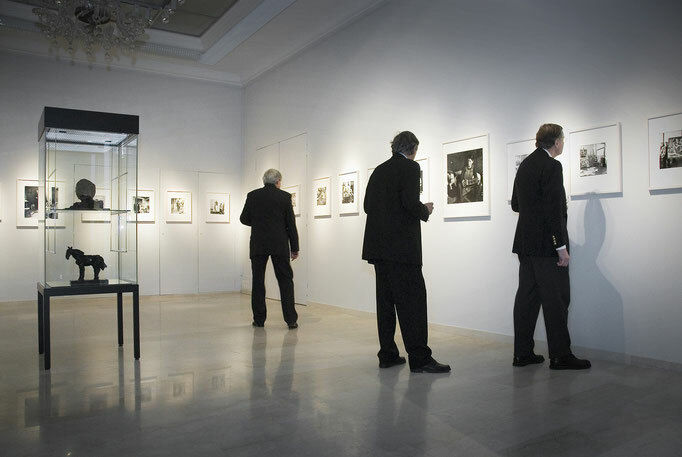 Over the many decades since its founding, Galerie Fischer has regularly been commissioned to auction major collections; foremost among them have been the following: the Count Harrach Collection, the Chillingworth and Wessner Collections (1922), the Grossherzoglich Sächsische Arms Collection (1927), the Collection of Prince Friedrich Leopold of Prussia (1928), the Rütschi Collection (1931), the estate of Dr Burger, the Erbach Collection of Arms and Armour (1931), the Freiherr von Kleist Collection, the Collection of Arms and Armour of Duke Viktor von Ratibor, the Prince of Thun Armoury (1933), the Arts-and-Crafts Collection of Dr Kodella (1934), the Hunting Cabinet of Reichsgraf von Kaunitz, the Bühler Collection (1935), the Randolph Hearst Collection of Arms and Armour (1939), the estate of Countess Tiele-Winkler (1951), the Schübeler Collection of Impressionist Paintings (1964), the Kurt Sponagel Collection (1965), the Erbach Castle Library (1967), watercolours, drawings and prints from the Prince of Liechtenstein Collection in Vienna (1969), the Habart Collection (1971), the Mayring Collection (1976), as well as collections from the hunting and art cabinets of many aristocratic houses of Germany and Austria. The spectacular auction Moderne Gemälde aus Deutschen Museen of 1939 saw works which had been denigrated as “degenerate art” to go auction, many of which are now to be found in some of the world’s leading museums. 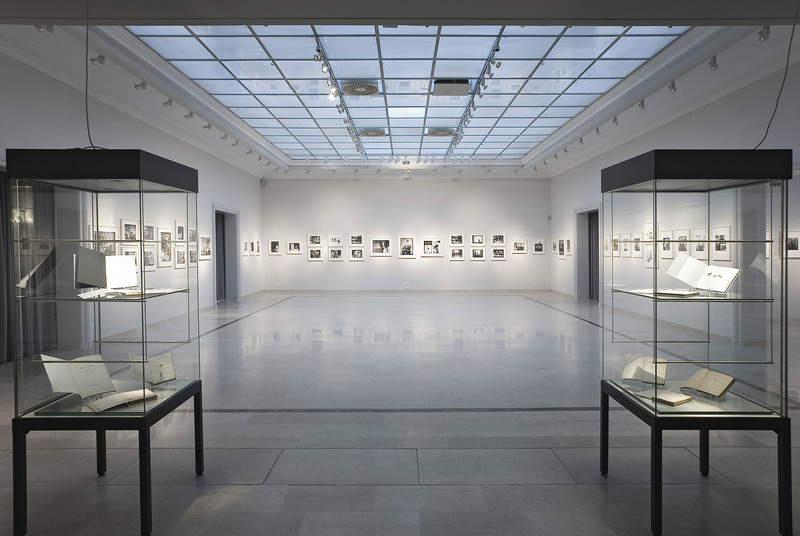 Galerie Fischer was and remains to this day an important intermediary in the process of setting up and expanding national and international collections. This past success is due in no small part to our commitment to the arts and to the art market, to our expertise and the contacts we have maintained over many years with major collectors, museum representatives and dealers, as well as efforts we have undertaken to satisfy growing interest from prospective collectors from Asia and Russia. 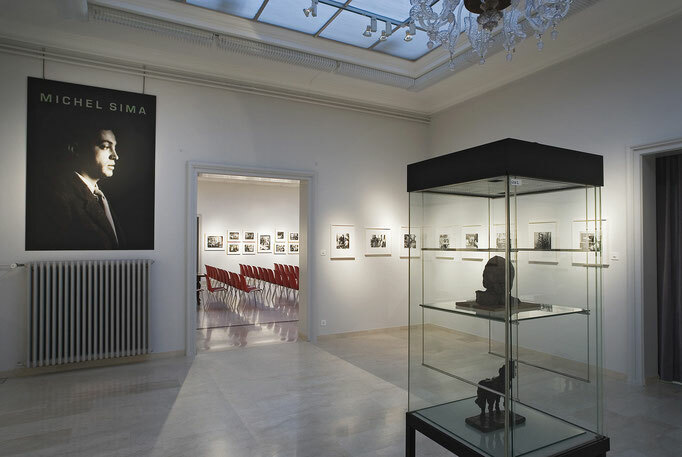 What’s more, for all its success, Galerie Fischer has remained on a human scale, to the benefit of the personal relations we nurture with our customers. More recently Galerie Fischer has taken a non-commercial interest in the fine arts, in various art exhibitions and publications, in private art collections, and in ensuring a sound legal framework for promoting private collecting. Major auctions of fine art are held twice a year at Galerie Fischer in May/June and in November, with an auction of antique arms, armour and militaria organised once a year in September. 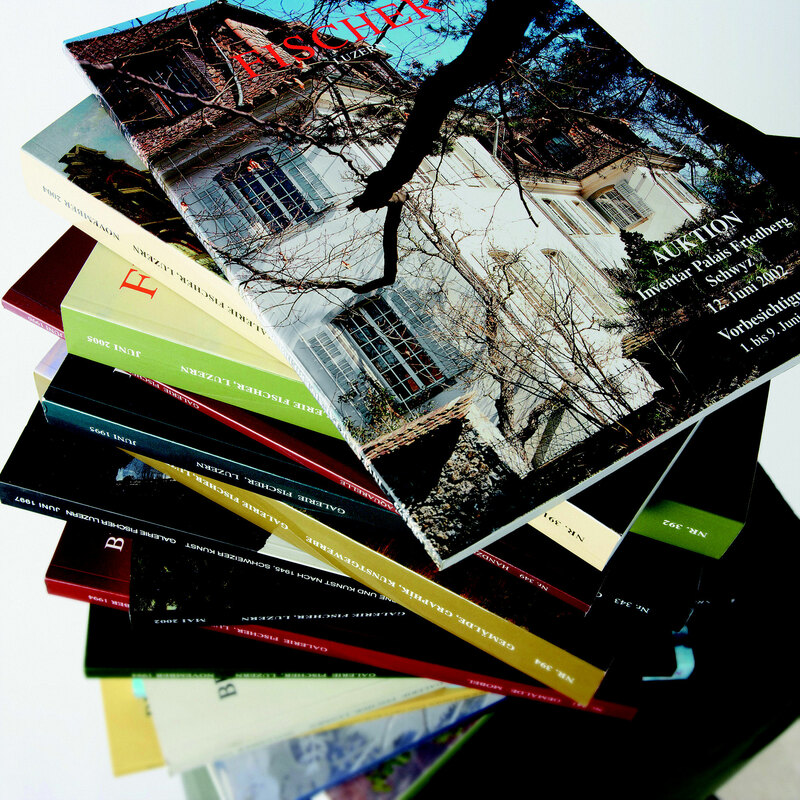 All the auction catalogues are research-based, whether they feature old master paintings, modern and contemporary art, works on paper, furniture, sculptures, Asiatica and non-European art, porcelain, silver, jewellery, pocket watches and wristwatches or antique arms and militaria; as a result they are much sought-after as reference books. Indeed they are printed in a large circulation and shipped to existing and potential customers all over the world. 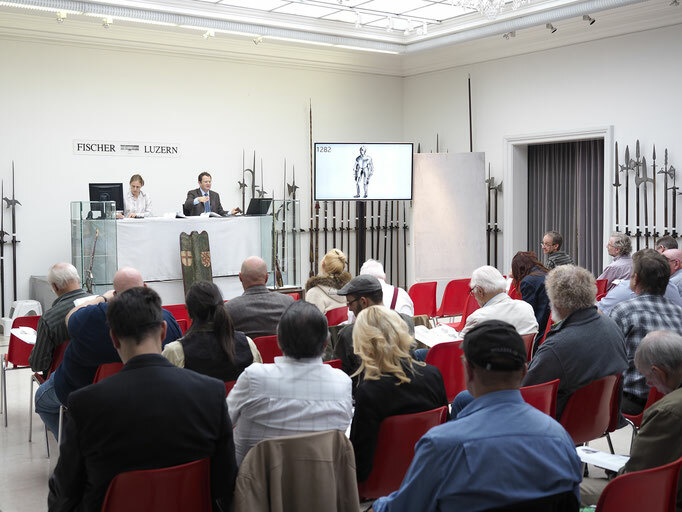 Our auction lots are also posted on the internet at www.fischerauktionen.ch.The objects featured at our auctions and the results of the auctions themselves are regularly discussed by leading art market journalists in international newspapers and magazines, and in art journals in particular. Today Galerie Fischer owes its eminent position as an auction house to the quality of its offer, especially paintings by old masters, modern and contemporary art, furniture, silver, jewellery, and antique arms, armour and militaria. It also boasts decades of good relations with major collectors, museums, dealers, art experts and others, both in Switzerland and abroad. 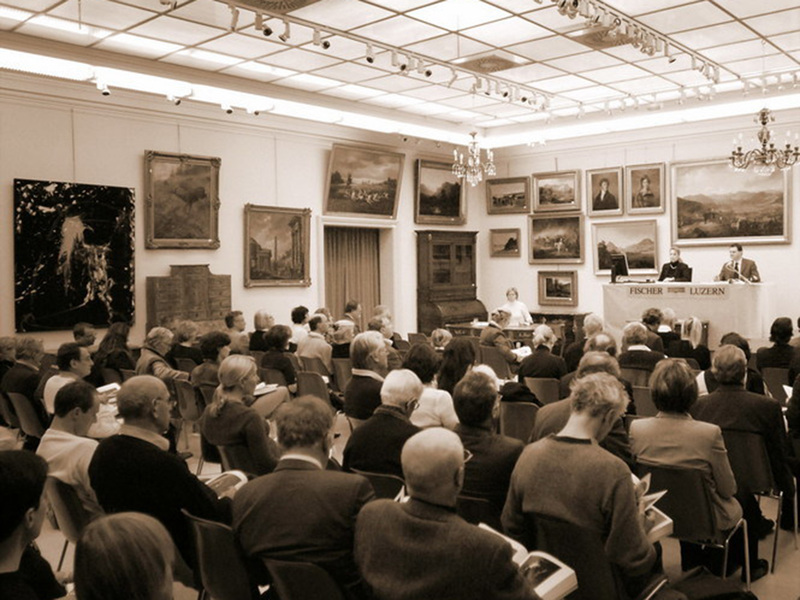 Galerie Fischer has been able not only to maintain its position as the most successful and well established auction house in Switzerland, but also to consolidate it further in recent times. The prices achieved at auction and the reports in the art market are proof positive of its status. To meet the growing demand for its services from international clients, Galerie Fischer has chosen to strengthen its international activities, by taking part for instance in the Asia International Arts & Antiques Fair (AIAA) in Hong Kong at the invitation of Asia’s leading dealers. Galerie Fischer is proud of its loyal and prestigious clientele, and of the fact that in recent years it has attracted many new prospective clients from Asia and Eastern Europe. Over the decades private collectors as well as some of the world’s foremost museums have added to their collections time and time again with acquisitions from auctions held by Galerie Fischer. It is therefore with great delight that Trude and Dr Kuno Fischer together with the experts and staff of Galerie Fischer - after the auction house’s 100th anniversary - look forward to the renewed opportunity of offering their auction services to their many customers. Since 2016 until further notice the Galerie Fischer Auktionen AG does not stage any auction. For the present it concentrates on appraisals, inventories, art consulting and private deals (check our services).